Researchers at the Max Planck Institute of Biophysics, Goethe University in Frankfurt and Martin Luther University in Halle-Wittenberg are deciphering the structure of the MHC-I peptide-loading complex. Nowadays, social media help us to keep abreast of current events. As we are unable to process the entire flood of information at once, neural networks extract only the information we need to know. The cells in our body act in a similar manner: In the fight against parasites, viruses and even cancer, a molecular machine called the MHC-I peptide-loading complex selects protein fragments important for the immune system. In cells, status updates in the form of small protein fragments carry information from the cell’s interior. These peptides are presented on the cell’s surface by MHC-I proteins, short for major histocompatibility complex class I proteins, so that they can be detected by the immune system. MHC-I molecules rapidly deliver information about cancer cells or virus-infected cells to the immune system. This enables the immune system to recognize degenerate or infected cells and eliminate them. However, a faulty message can lead to autoimmune diseases or chronic inflammation. “In order to investigate the structure of this extremely fragile complex, we first developed a molecular bait. Using this tool, we were able to isolate the MHC-I peptide-loading complex from the endoplasmic reticulum,” explains Simon Trowitzsch of the Biocenter at Goethe University in Frankfurt. 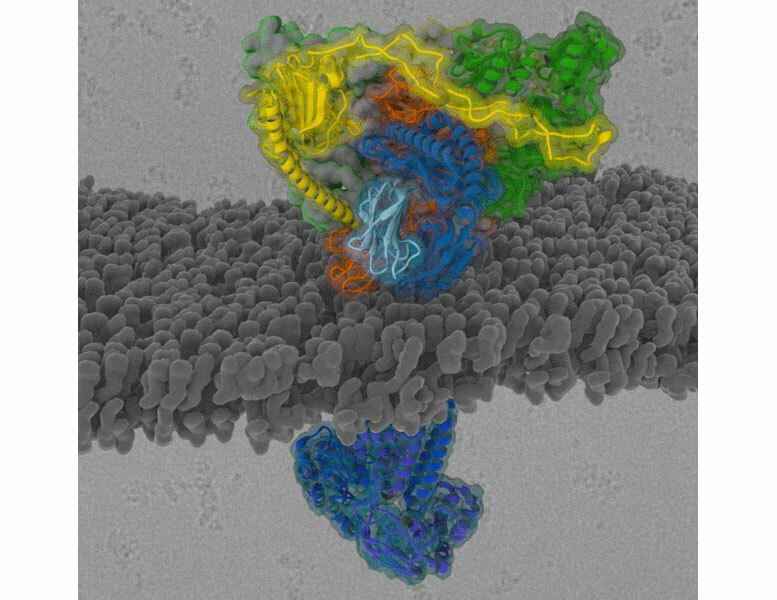 “Thanks to groundbreaking improvements in cryo-electron microscopy, which recently garnered the Nobel Prize, we were able to observe the MHC-I peptide complex directly and elucidate its structure,” adds Arne Möller of the Max Planck Institute of Biophysics. In order for the cell to provide information to the immune system, membrane transport proteins, folding enzymes and MHC-I molecules must work together precisely within a complex. The results of the study show how the MHC-I peptide-loading complex filters out only those protein fragments that are recognized by immune cells. “These findings are significant because viruses and cancer cells interfere with information transfer and are able to outsmart the immune system. We now better understand how cells select antigens to detect cancer or infections. This could help to improve immunotherapies,” says Robert Tampé of the Institute of Biochemistry at Goethe University. Be the first to comment on "Researchers Decipher the Structure of the MHC-I Peptide-Loading Complex"